This post is a tidier version of a talk I gave to the Philadelphia Science Fiction Society in October, 2012. The purpose was to give some concrete examples of how my research reading finds its way into my fiction. 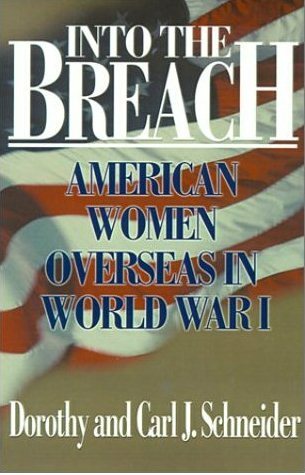 I read Into the Breach: American Women Overseas in World War I by Dorothy and Carl Schneider early on in my World War One research, for my first attempt at a historical novel; when I later had the opportunity to write a short story about women in WWI, I chose the canteen workers simply because they were rarely featured in fiction (mostly, you get nurses and ambulance drivers). It’s a very short story, so I didn’t have a lot of room to set the scene; therefore, it needed to be dense with detail. By January of 1917, I was serving soup and cocoa to soldiers either on their way to the Front or returning from it via boxcar. Sometimes I and the other canteen “girls” worked forty-eight hour stretches without a break. I blessed the chance that sent few British or Australian soldiers through our little town, for I found it easier not to share a language with the boys who were being sent to die, and easier still not to understand the words of those who returned, covered in filth and lice from the trenches. At the same time, I yearned for my own language. When the woman in the fur coat spoke to me, I had not seen another English-speaking woman for six months. “Are you the American?” she asked, coming up beside me. I managed not to spill the hot cup I held, instead giving it to a poilu with a ragged moustache and hurriedly filling another, for the next exhausted soldier in line. “Yes,” I said. “Mary Fraser.” I handed over the cup and filled another. Her fur coat puzzled me, but perhaps she was one of those volunteers who had money. I had to admit that she was undoubtedly much warmer than I, in a battered Belgian army overcoat. Miss Marling served cocoa and then tea when the cocoa ran out, and finally, at about one in the morning, helped me and the others to scrub out the cauldrons and dippers in preparation for the next onslaught. By then, I had learned she was a journalist who had obtained credentials from a Belgian agency, but little more. Following that short project, I decided I needed to read more deeply about the war itself. I very swiftly became engrossed and began building a library, focusing my reading on the early days of the war and on academic studies of certain aspects, such as social histories of PTSD and men with physical wounds. For The Moonlight Mistress, which begins right as the war is starting, I relied on 1914 by Lyn Macdonald, which is comprised entirely of memoirs of the British Expeditionary Force. I used a number of different people’s accounts to write about the retreat from Mons; what it felt like to be in France, at that season, in that situation. I amalgamated all these experiences, and ended up with scenes like this one. Gabriel slid from tree to tree until he reached the low wall bordering the cemetery. He stepped over, then wriggled to the road on his belly. The terrain dropped towards the canal just in front of him, and he could see. Smoke scummed the air. He smelled acrid burnt powder. Gray-uniformed men crowded the width of the bridge, firing as they advanced, struggling to climb past fallen comrades who blocked their way to the bank. He tried to count, to estimate their numbers, but kept losing track at the middle of the bridge. He couldn’t see how far the crowd of Germans stretched on the other bank. Two companies? Three? A cluster of willows on the opposite bank blocked his view. Where were Ashby and Daglish? Were they safe? He sighed in relief when he spotted Daglish’s stocky torso on the right flank. He looked to be under adequate cover, training a pair of binoculars at the opposite bank. The men were doing well. He estimated twelve to fifteen rounds a minute, at the least, and considerably more accurate with their aim than their German opponents, even given that the Germans were exposed and moving. He crushed the thought that he, too, might have to shoot soon. He’d never killed a man. He’d never intended to. He only hoped he could manage it if the need arose. As Gabriel watched, Cawley and Lyton each fired a final round from their advance placement, then abandoned the wagon’s inadequate cover and retreated for the barricades. Cawley went down, his body jerking with the impact of two, then three bullets. Gabriel closed his eyes for a moment, but the picture was the same when he opened them, Cawley sprawled amid the lush grass and wildflowers like a painting, bright and unreal. He didn’t move again. Lyton didn’t see, and a moment later was dragged behind a heap of sofas and thrust into a trench. Smith and his platoon edged their way along the other side of the road. He could see Smith’s fevered grin even at this distance, Figgis close by his shoulder with an unlit cigarette hanging from the corner of his mouth. Once darkness fell, the shooting slowed to an occasional crack. Gabriel was shocked that the Germans seemed to be halting for the night, though if they’d had as little rest and food as his own men, he shouldn’t be surprised. As soon as he judged it safest, Ashby got them moving, chivying them along like sheep until they reached the cover of the next hamlet down the road. Wisely, its inhabitants had already fled before the German onslaught. Gabriel entered another church, a much smaller and humbler one than before, when he and Lieutenant Daglish were assigned to fortify the building as best they could. They worked in companionable silence, then split the abandoned communion loaves among the men and allowed them to sleep, some for the first time in nearly twenty hours. A bicycle messenger found them four hours later with new orders. This line of defense was being strategically readjusted. They must make all speed. Again. Later in the same novel, I needed some specific detail for an action scene, to make it less run-of-the-mill. 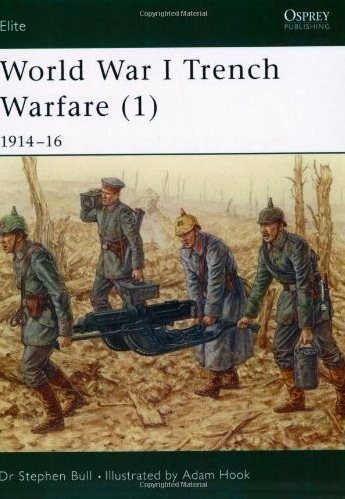 I turned to World War I Trench Warfare: 1914-16 by Stephen Bull, an Osprey book, where I learned about jam tin grenades and sniper camouflage. Osprey books are superb for that sort of physical detail. I found a picture of a costume snipers would sometimes wear, and information about the use of grenades, including the fact that production could in no way keep up, so soldiers cobbled together their own; conveniently, there were instructions for doing that. Hailey produced the map drawn by Major Fournier and the list of supplies which she and Sister Daglish had arrived at together. The fabric and notions were for Bob to make camouflage clothing and masks like those used by snipers, to enable them to pass as closely as possible before beginning their bombardment, which would involve as many jam tin grenades as the three of them could manufacture in the time available. Major Fournier had promised tobacco tins, gun cotton, and fuses for those, with apologies that he could offer nothing better; the French had no more proper grenades than the British. She crawled back across the stretch of bare ground and squirmed down into the scratch trench Daglish had dug for cover, between the two men. Daglish lay on his belly, his head turned towards Meyer, though she couldn’t see the direction of his gaze through the camouflaged sniper’s hood he wore. Meyer had the deeper side of the shallow trench; he crouched over their grenades, inspecting the tobacco tins for leaks or damage from the trip here. Daglish rose slowly, stretching his arm and rotating it to make sure his sleeves–uniform beneath, sniper tunic above–wouldn’t catch and land a grenade on top of them. He scooped up a tin in each gloved hand and held them out to Bob, who held the pipe bowl to the fuses until they caught. Together, they counted, then Daglish threw, strong clean arcs that nearly made her whistle in admiration. He’d easily cleared the tall fence. She counted another second, then two explosions ripped the air, one after the other. Sound rushed in on her, and she realized she hadn’t been breathing, but she was already lighting the next grenade, holding the fuse steady in the bowl of the pipe until sparks crackled, slowly eating their way up the fuse, towards the tight-packed gun cotton. The explosion would fling free the nails and other bits of metal rubbish they’d packed into the tin. The sharp odor of gunpowder singed her nostrils, or was it smoke from the laboratory compound? She held the grenade up to Daglish without looking at him, shook burning ash off her leather glove, then began to light the next fuse. I also gave some examples from work that’s still in progress, but this is getting long, so I’ll save that for a future post.